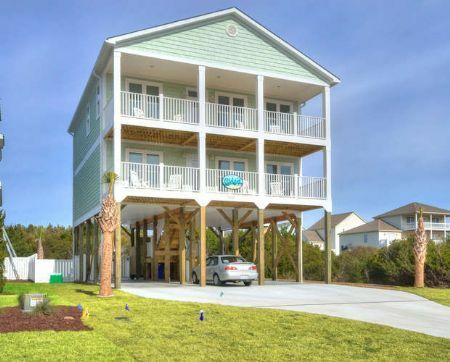 7006 E. Beach Drive-Unbelievable 2nd row 5 BR, 3 1/2 Bath new construction home with swimming pool, 2 oceanfront family rooms, double ocean side decks, an inverted floor plan, awesome views and on a quiet street with little traffic! Across the street from the public beach access. Unbelievable ocean side views!! Inverted floor plan. Close attention paid to detail, large family room with 60" HD TV. 2nd oceanfront family room located on the 1st floor to give everyone a little more space. Private pool located in the fenced in back yard and ready for your family's enjoyment, 1 outside shower, large kitchen open to family and dinning room, large eating bar, dining table seats 8. Nice ocean side master suit with title shower. Home has 1 King, 2 Queens, 2 Twins over double bunk beds. TV in every bedroom. House is located beside St. James by the Sea. Ocean side view double decks, wireless high speed internet, and much, much, more. Convenient to golf, shopping, restaurants, groceries, and of course, the beach. Enjoy a cold beverage and the company of friends and family, while the kids enjoy a dip in the pool. Make your reservation today. This property was even better than described! The kitchen is better stocked than my own. Custom touches throughout the home. Our group of 10 ranged from 7 months to 60+ and everyone enjoyed the comfort and convenience! Hello Jane! Thank you so much for your review! We are excited that you have given us such great feedback. We are working very hard for all of our vacationers and it is so wonderful to see it paying off!! Thank you so much! We hope to 'SEA' you on your next vacation! Life is Better at the Beach! We were only there for a short time, but the proximity to the water, the pool in the back and the home itself were perfect for our stay. Thank you. Hello Brian! Thank you so much for your review! We are excited that you have given us such great feedback. We are working very hard for all of our vacationers and it is so wonderful to see it paying off!! Thank you so much! We hope to 'SEA' you on your next vacation! Life is Better at the Beach! Our vacation here could not have been better. The house is beautiful as well as being very comfortable and well equipped. The street is quiet with beach access just a few yards away. There are ocean views from multiple rooms. The property manager was very friendly and helpful. Check in and out was a breeze. A well kept place, matching all advertising. Ideal location. I think everyone (6 adults & 3 children) liked the place & loved the location. A very short walk to the beach. We had enough bedrooms & bathrooms, and towels/bedding. The kitchen/dining room & culinary tools helped with many wonderful meals. The balconies were used often. The 20 month old granddaughter could manage all the stairs, and most of the doorknobs (unfortunately). The backyard pool was used often. There was a problem with the dryer, but the management said that maintenance fixed it. And (God be praised), the weather was great! No rainy days.